Could you live on Mars? Certainly not without great design and engineering. 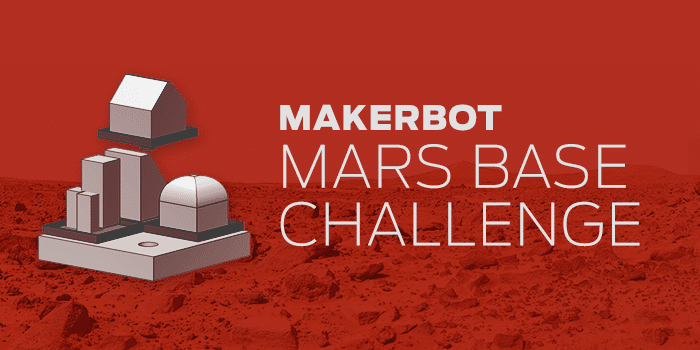 That’s why we, in cooperation with NASA’s Jet Propulsion Laboratory, are excited to present the Makerbot Mars Base Challenge. Taking Mars’ extreme cold, high radiation levels, lack of oxygen, and frequent dust storms into consideration, design a utilitarian Mars base that can withstand the elements and maybe even make you feel at home, despite being 140 million miles away from Earth, on average. Learn more about Mars and what kind of home could actually sustain life there on the Imagine Mars site. Upload your design to Thingiverse with the tag #MakerBotMars between May 30th and June 12th. Entries must be tagged #MakerBotMars to be considered and will be judged by a subjective panel of NASA-JPL and MakerBot employees on scientific feasibility, creativity, and printability. Make sure to read all the Official Rules here. GO!